Bit Of Byrd: Thankful Thursday- #Commenthour! 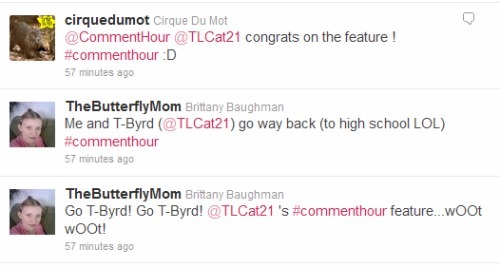 I was featured last night for #commenthour!!!!! cannot believe it! there are even more than what is shown too! #Commenthour is great fun. I am thankful for the new blogs I have been able to discover and the new twitter friends I have found. A whole bloggy, twittery community. It allows blogging to be much more fun than talking to a void. It made me evening and I am hoping the high carries me through today. Also... 7 days until my family comes in town for cruise! If you want to check out the full list of featured blogs last night it can be found here!